Harry Cecil Bloor was born on 18th March 1898 at Rotherham, the son of Walter and Elizabeth Bloor. He left his job as a clerk with the Enfield Brick and Terra Cotta Company to enlist in the Reserve Company of the 11th East Lancashires on 18th January 1915. Towards the end of the battalion's time at Caernarvon, an attempt was made to send home all those under 19 years of age. Bloor - then barely 17 - bluffed his way through, adding two years to his age, and was subsequently assigned to "W" Company. 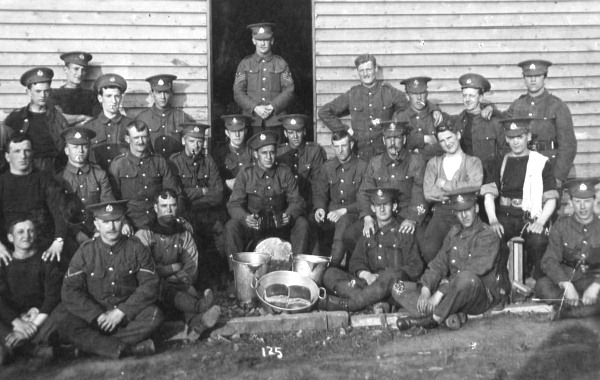 Above: "W" Company group at Penkridge Bank Camp, Cannock Chase in 1915. Harry Bloor is standing at the far left on the back row (jacket open). Photograph courtesy of Paul Harrison. As the tension rose in the days immediately before the attack on Serre of 1st July 1916, one petty argument ended in Bloor's pal Norman Lightfoot - a Sanitary Corporal exempt from taking part in the attack - being told to "shut up - you won't have to go in". Lightfoot took the rejoinder badly and asked his Company Commander for permission to join the attack; he was killed, two days short of his 21st birthday. In the early hours of 1st July, Bloor and his companions in No.2 Platoon reached their jumping-off position in the muddy, shell-damaged front line trenches below Serre. There was little to encourage them; the distribution of wire-cutters a few hours earlier was a clear sign that the artillery bombardment of the preceding week had failed to clear the barbed wire entanglements protecting the German lines. There was no chance of sleep and no food, with only a tablespoon of rum in advance of the attack. "At 7.20am, we started very heavy trench mortar fire and Plum Puddings etc. and very heavy shell fire and were ordered out of the front trench to lay down in No Man's Land as near to our own bombardment as possible. At 7.30am I saw arms raised and motioning us to advance. The Germans knew the time of the attack and literally sprayed the top of the trench with machine gun and rifle fire before we climbed up the short ladders at 7.20. When we tried to advance at 7.30 already a lot of the fellows had been hit and as we walked towards the German front line I saw the men going down all around me. I had a pair of wire cutters attached to my rifle and was trying to cut the enemy wire when I was hit. I remember seeing the Germans more or less shoulder to shoulder and there seemed to be at least one machine gun in every bay. My thoughts were that I wouldn't be much use if I DID get through the wire. I saw about 3 or 4 men only struggling to get through the wire which didn't seem to have suffered much with our shelling. I lay very close to the ground after I was hit. After a while I realized the rifle fire had quietened down and I think that our 2nd and 3rd wave must have tried to break through whilst I lay there. I then decided to try and crawl back to our own lines. I got about half way (40yds) when machine gun fire broke out again and I slid in a shell hole." Bloor was joined in the shell hole by two badly wounded Pals. He himself had been hit in the heel, where a piece of shell casing still lodged. Determined to avenge a friend killed some 10 days before, he shot off 15 rounds at the Germans manning the front line, and claimed to have seen one throw up his arms and fall back. Bloor remained in the shell hole until night fell on 2nd July, some 38 hours after being wounded. He crawled slowly backwards, eventually dropping into the British front line to find it still filled with wounded Pals. The next morning he was seen by an officer and told "if you want to get out of here, lad, crawl!". It was not until the night of 3rd/4th July that Bloor finally had his wounds treated at a Casualty Clearing Station. Harry Bloor was discharged from the Army in June 1917 and emigrated to Canada before re-settling in Accrington in 1934. The following year he made the first of many pilgrimages to Serre, the last of which was in 1974. Whenever possible, he stood on the site of the British front line at 7.30am on 1st July. Harry Bloor died on 1st January 1976, and lies buried in Accrington Cemetery. 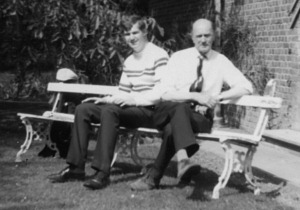 Right: The author and Harry Bloor in 1972. This account is based on information originally gathered by Martin Middlebrook and kindly released for this publication by the copyright holder, Ross Davies. It must not be reproduced in any form without permission of the copyright holder.